In the first part of this series, doubt was described as a set of four perceptual processes that trigger a downward spiral in a project or change initiative. These processes are typically unconscious and unspoken thereby granting the insidious quality of undermining projects and change initiatives. A common response is to ignore the doubt or dismiss it as unimportant. The countervailing functions that preempt the downward performance spiral are a constant and conscious observation of how subtle shifts in priorities, leadership, delivery, and messaging are occurring. In general, these shifts taken individually will appear as harmless or inconsequential; however, when perceived as individual red flags, an awareness of the evolving downward spiral highlights that an unconscious self-fulfilling prophecy of failure is at play. In the second part, it was shown that doubt can be internalized and turned-into self-doubt that is experienced as there’s something wrong with me or there is something wrong with the project. It was further elaborated that the discomfort leading to self-doubt is a normal human process that often leads to cognitive dissonance. The dissonance is based on the double bind that doubt is normal and that it is perceived as a sign of weakness in most organizations. Faced with changing beliefs and/or actions, the dissonance can crescendo into a change of perception of the actions taken. 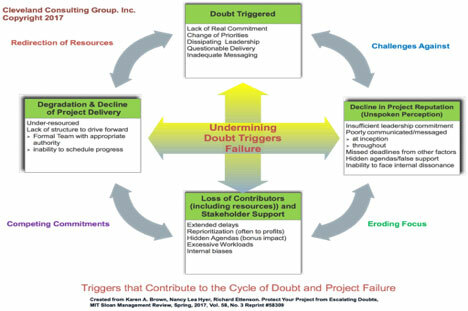 When applied to the cycle of doubt, the change of perception of the actions taken become the rationalization (reconceptualization, and/or reframing) for the withdrawal through redirection of support that leads to the downward spiral of the project or change initiative. If left unchecked, the self-doubt leads to the self-prophesized downward spiral in performance. In this part of the series, we reframe the discussion to engage, explore, and use doubt through abductive logic and sensemaking as a form of integrative synthesis. We will examine the abductive (best guess) logic often used to address and resolve the doubt, often diminishing the original commitment to the project. We will further explore how Festinger’s cognitive dissonance, often triggered by doubt, is a natural process that seeks to expand understanding in a chaotic world. It ensures that the complex interplay between belief and doubt is continuous; therefore, doubt is not the interruption of action (although it may interrupt specific actions). Rather, it is the impetus to ensure that beliefs are examined and remain malleable, adaptive, and increasingly complex. As such, it is indicated that the often-disconcerting tensions between belief and doubt are necessary for creative action and ordinary problem solving. (Locke, Golden-Biddle & Feldman, 2008, 909) Doubt treated as time to pause and expand the problem definition can break habitualized thinking and rote problem-solving. Abductive logic is the generative process of dealing with the dissonance created between discordant beliefs and actions. It seeks to create a “best guess” for the correct action in the present context. It is triggered by the doubt implicit to the dissonance and is a mode of reasoning in which the actual is interpreted and constructed in terms of past experiences and beliefs about what is possible that could dissolve the dissonance. Abduction, however, in its natural state rests on the capacity to reveal the possible, whether through creative thinking, imagination, or brain-storming that can lead to a new locus of meaning making shrouding the dissonance. If successful, the new locus of meaning making will dissolve the doubt and therefore the dissonance between the action and internal/core beliefs. A new leadership paradigm might evolve, for example. However, if an unconscious, negative valence is applied to the new meaning-making process, such as “I might not get my bonus” or I don’t want this failure hung on my career”, the tendency will be to preempt these negatively perceived consequences by moving into self-doubt (self-justification) and subtly undermining the project or change initiative as indicated in parts 1 and 2 above. When we combine the process, we discover that belief is the way we take the world as given. It reflects the current organization of our experiences and observations. Doubt indicates the breaks and breaches in that organization that leaves us feeling uneasy, uncomfortable, irritated and wanting to return to a sense of confidence. Abduction (best guesses) seeks to explore the breaches revealed by the doubt and to create new perceptions that could support new ways of acting in the world, thereby transcending the sense of discomfort that there is something wrong with one self (self-doubt) and/or there is something wrong with the project or change initiative that requires reallocating resources. When these cannot be resolved through a new locus of meaning, the individual will likely bracket the dissonance to adequately perform by rationalizing the dysfunctional behavior or leave the organization. The abductive process is a form of inference or intuition that allows for the creation of new knowledge and insight. Struck by a sense of doubt or dissonance (that can be debilitating or exhilarating), the mind seeks to understand the discomfort by creating a variety of hypotheses. If the discomfort is fully explored, as described by Peirce, an “abductive suggestion comes like a flash... in an act of insight…. putting together what we had never before dreamed of putting together.” (Peirce, 1988, 227) The tension created from the original doubt supports the belief to become malleable, adaptive and expansive so that new insights, patterns, themes, and awareness can be perceived. Kolko describes this process as “synthesis” which he defines as an “abductive sensemaking process.” (2010, 17). Klein, Moon, and Hoffman expand the understanding by defining “sensemaking as a motivated, continuous, effort to understand connections (which can be among people, places, and events) to anticipate their trajectories and act effectively.” (2006, 71) In other words, sensemaking is an action oriented process that people automatically go through to integrate experiences into their understanding of the world. Whether it becomes insightful and exhilarating or stifling and debilitating depends on the individual or organizations ability to embrace doubt as a natural occurrence that needs to be fully explored. It would be too simple to say that with a shift in thinking to embrace doubt, the magic of abductive logic would appear. “Abduction is not just something that we do; it is a consequential process” (Locke, et al, 2008, 913) that is as much felt in the emotional and physical tension and discomfort as in the cognitive dissonance of doubt. It can engender feelings of incompetence by turning toward not knowing and embracing the unfamiliar which crystalizes in Perin’s “doubt shadowed by discovery” (2005, 214). Organizations often struggle with not knowing just as much as individuals are taught to not to express doubt. Nonetheless, the perceptual bias of blind alleys, black holes, and deep abyss are part and parcel of the discovery process as they reveal not only the unknown but possibilities hidden within the doubt that can be revealed through intentional and unintentional experimentation. However, the tendency is to hold tightly to the belief that one already knows how to understand the facts or observations and ignore any doubt or more deftly deny that that there ever was any doubt. (Argyris, 1991, 6) Nonetheless, to make doubt generative, it is must become normalized as a leadership and organizational dynamic. 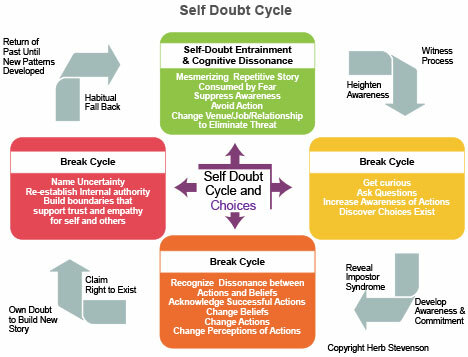 Acting like doubt does not exist by supporting prevailing myths that acknowledging and embracing it is a sign of incompetence or weakness perpetuates the insidious aspects described in part 1 and empowers self-doubt as indicated in part 2. The adage doubt kills more dreams than failure ever will ties back to the cognitive dissonance that “doubt is tied directly to fear, loss of security, and threats to self-esteem. … [whereas its antidote] …conviction…. is tied to curiosity, inspiration and our eternal hope for a better future.” (Srikantia & Pasmore, 1996, 43). Organizationally, Schein has indicated that how uncertainty and doubt are expressed is influenced by the founders’ mentality, the firm’s embedded decision-making processes, and the industry. (Schein, 2010) These are translated over time into basic underlying assumptions of how to behave that are in turn expressed as espoused values. Inconsistencies can abound in these translations between what is espoused versus what is practiced. (Argyris, 1986, 1991) However, often, “the problem is not an inability to take action but an inability to take appropriate action. There can be many reasons for the problem –ranging from managerial stubbornness to sheer incompetence – but one of the most common is … active inertia.” (Sull, 1999, 1) Locked into a false sense of security, organizations often respond to even the most disruptive changes by accelerating activities that worked in the past. Doubt is ignored and perceived as a waste of time. The gap between the espoused and actual values are often wide, however, to narrow the gap, the organization must be willing to acknowledge not only the gap between espoused values and actual practices, but how they form active inertia1. In such cases, learning begins with individual doubt about the gap between the espoused values and the actual practices that lead to the active inertia. Therefore, learning is driven by individuals that are willing to examine alternative interpretations of reality…and to communicate their interpretations to others for organizational adoption. 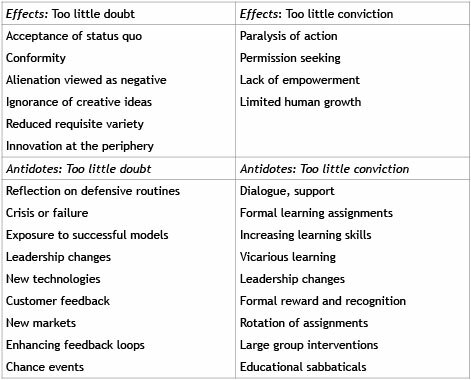 (Srikantia & Pasmore, 1996, 44) This is a daunting process because, as indicated above, most organizations tend to equate doubt with indecision, while from a learning perspective, doubt is essential for progress. One differentiating factor between individuals that look and learn from doubt and then take action and communicate what has been learned to the larger collective (organization) is conviction. As indicated above, embedded and unspoken cultural norms can make it difficult to reveal any sense of doubt about how “things are done around here” or more importantly, “how things are perceived or solved”. Therefore, creating conviction as an embedded cultural principle, to look, listen, act, and learn in areas that are ‘unsafe’ by virtue of the entrenched ways of doing things requires individual willingness to act, even in the face of significant roadblocks including sanctions for failures. Conviction, therefore, creates a conscious presence to break the modes of entrenched behavior that leads to unconscious inaction and active inertia. However, in truth, convictions that are already embedded in the culture can get lost in the gap between embedded culturally espoused theories of action and actual actions. To overcome this gap, executives must model effective use of doubt. For example, most executives have absorbed the paradigm to never express doubt as indicated by Argyris above and reinforced by “followers expect them to be decisive and confident”. (Vermeulen and Sivanathan, 2017, 7) However, to normalize expressing doubts increases psychological safety and opens the door to explore cognitive dissonance (gap between beliefs and actions) as a cue to expand the context and conversation. The executive leadership must model and support such behavior until it becomes normalized. This can be done by openly expressing doubts about a project and inviting more conversation. (Vermeulan & Sivanathan, 2017, 7). It can also be invited by asking “what are we not seeing” and “what are we not expressing but are thinking”. In doing so, it expands the conviction to look, listen, act, and learn to a personal commitment. Modeling this conviction leads to a visible understanding that the executive is committed to the organization, the team, and the project, including revealing any doubts that need vetted before taking final action. As such, the executive’s conviction is not another impersonal directive; rather, it becomes a highly visible, action, promise, statement, or decision made by the executive as fully invested individual as well as the executive leader. Combined, when personal commitment is tied to the cultural convictions of the organization, clarity in how to behave becomes clear. Conviction becomes the driving principles that drive the modeled clear, credible, and courageous commitments of the executive. (Sull, 2003, 10) Therein, doubt can become a source of information, an abductive logic, that can support the organization to greater success. An interesting correlation of the cause of doubt is the story told by Dr. Jerry Harvey, called The Abilene Paradox. In basic terms, it is how teams diminish their individual responsibility to speak up during team discussions. The common results are that, individually, each team member fails to express their doubt about a project resulting in less commitment to the project and a refocus of resources that leads to failure or sub-optimal performance. For those familiar with Harvey’s tale, this three-part series mirrors the road to Abilene. It is clear that most organizations have fallen prey to the undermining triggers of doubt that can lead to failure. Individually, self-doubt has led many a leader astray by delving deep into cognitive dissonance and less than stellar behavior. Finally, many organizations ignore doubt as a means that can be incorporated into the approved method of decision-making and creative problem solving. It is my hope that this three-part series will open discussions into “how we have always done things around here” so that a reframing of how to bring doubt and abductive logic into the conversation for better decision-making and creative problem solving can occur. I am sure many will rename the process from doubt to “how we address hesitancies or concerns”. Regardless, many of the present executive constructs inherently build buses to Abilene that may be hard to accept without their understanding that leadership is about creating the reality instead of using spreadsheets to ensure bonuses. 1 Sull expands the active inertia caused by the gaps between espoused values and the actual way work is done through the transformation of (1) strategic frames comprised of the assumptions used to view the business into blinders, (2) processes that are the way things get done becoming habitualized (unconscious) routines, (3) relationships with key stakeholders becoming shackles instead of contributors, and (4) values, the shared beliefs that sustain the culture, becoming immutable dogmas. Argyris, Chris. (1986) Skilled Incompetence, Harvard Business Review. September-October. Reprint 86501. Locke, Karen. Golden-Biddle, Karen. Feldman, Martha S. (2008), Making Doubt Generative: Rethinking the Role of Doubt in the Research Process, Organization Science (Perspective) Vol. 19, No 6, November-December. 907-918. Peirce, C. S. 1931–1958. C. Hartshorne, P. Weiss, A. Burks, eds. Collected Papers of Charles Sanders Peirce, Vols. 1–8. Cambridge University Press, Harvard, MA. Perin, Constance, (2015) Shouldering Risks. Princeton University Press. Princeton, N. J.
Schein, E. H. (2010). Organizational Culture and Leadership. Jossey-Bass. Srikantia, Param and Pasmore, William. (1996) Conviction and Doubt in Organizational Learning. Journal of Change Management. Vol. 9, No. 1. 42-53.